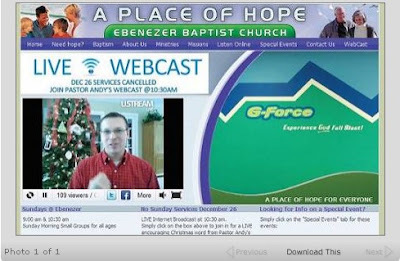 Pastor Andy Childs of Ebenezer Baptist Church in Toccoa, Ga., speaks to others online from his home Dec. 26. Childs and other church leaders patched together the idea for a webcast the night before as snowy weather descended on north Georgia. Using the social media site Ustream, Childs was able to broadcast from his home while church members logged in online for the 10:30 a.m. service. 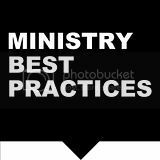 Jones created a link to Ustream from Ebenezer's website to simplify the process. "He's the tech guy; I'm just the dreamer," Childs, 39, said. "I wanted it to be from our home page and made simple to use." Childs' idea came from using Skype, a free online software application that allows users to make video phone calls. Childs and his wife had used Skype to call her family in Arizona for Christmas. In planning an alternative to meeting at the church building, Childs looked at taping a message versus a live broadcast. Ustream provided the option for the webcast, while 40-50 local churches ultimately cancelled their services. 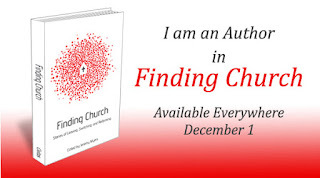 I am from North Georgia, and my church canceled services because of the inclement whether. What do you think of the idea? Would you ever try it?